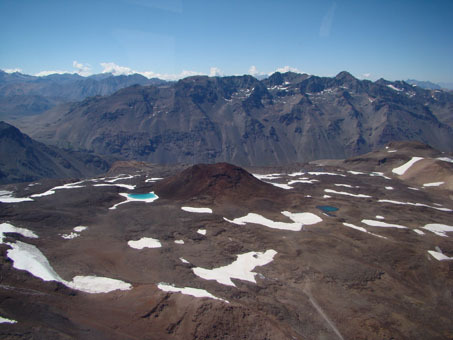 The magnitude 8.8 Maule Chile earthquake that occurred in 2010 caused subsidence of five volcanic regions in the Andes within weeks of the event. The subsidence was observed via satellite imagery and is attributed to the migration of hydrothermal fluids. Similar subsidence was observed at volcanoes in Japan after the magnitude 9 Tohoku earthquake of 2011, indicating a common connection between large earthquakes and nearby volcanic centers. Satellite images from the Advanced Land Observing Satellite (ALOS) operated by the Japan Aerospace Exploration Agency were acquired for all of the active stratovolcanoes in the Andean Southern Volcanic Zone during and after the Maule earthquake. 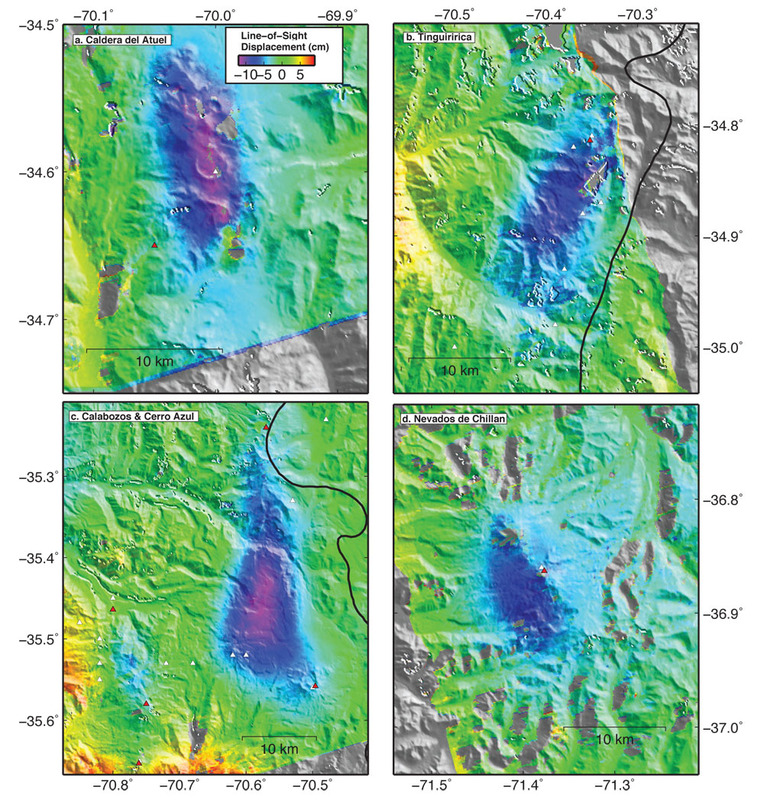 The interferometric synthetic aperture radar (InSAR) images show changes in the land surface. Between about 5 to 15 centimeters of subsidence was found at five volcanoes along a north-south line that is parallel to the modeled offshore displacement (i.e. 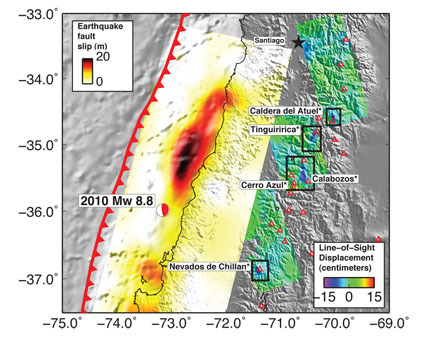 coseismic slip) caused by the earthquake. The subsidence is attributed primarily to the release of hydrothermal fluids beneath the surface. Nighttime satellite thermal infrared data from the Advanced Spaceborne Thermal Emission and Reflection Radiometer (ASTER) and Moderate Resolution Imaging Spectrometer (MODIS) operated by NASA of the volcanoes indicated no significant new thermal activity right before or after the earthquake. Therefore the volcanoes were not erupting or releasing any significant gas emissions at the surface that might have caused them to subside. 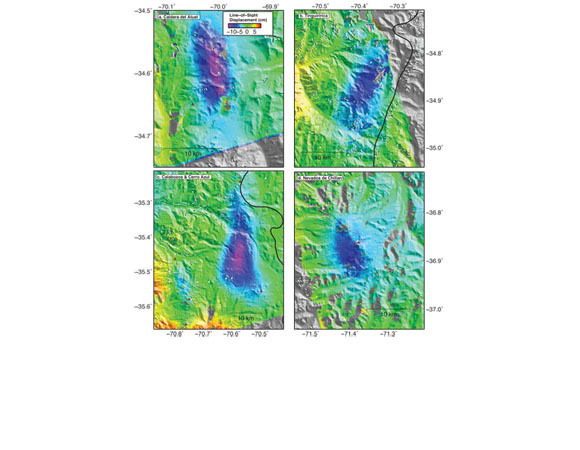 Satellite imagery shows subsidence at five volcanoes in the Southern Andean Volcanic Zone associated with the migration of fluids because of deformation caused by coseismic displacement from the 8.8 Maule earthquake. A model of the fluid migration calls for a magmatic and hydrothermal system with a north-south orientation parallel to the plate boundary and associated faults. Similar observations at volcanic regions in Japan after the 9.0 Tohoku earthquake suggest that magmatic systems parallel to major subduction zones will typically get squeezed by large earthquakes causing fluid migration. The fluid migration causes the active volcanoes to subside. 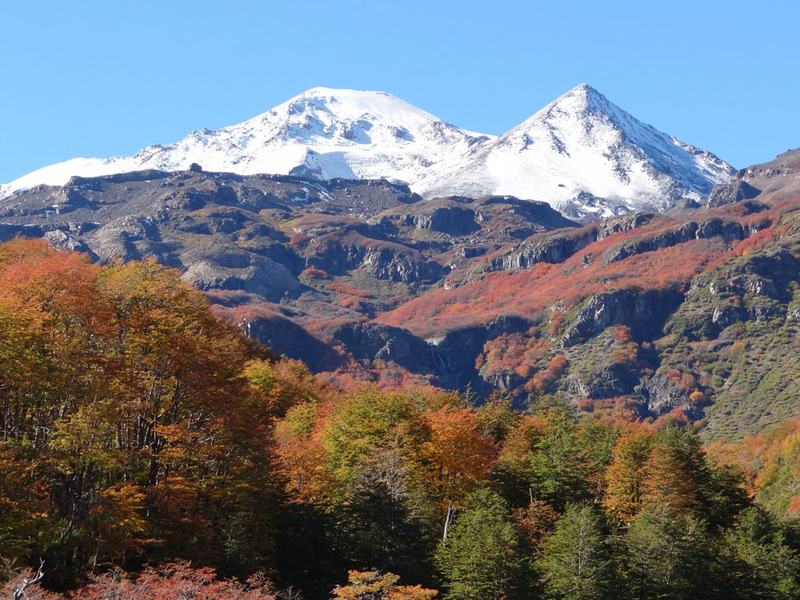 Triggered eruption of nearby volcanoes after large earthquakes is relatively rare and this study supports these historical observations. 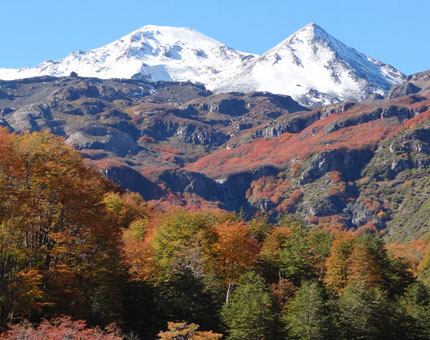 Publications: Subsidence at southern Andes volcanoes induced by the 2010 Maule, Chile earthquake, M.E. Pritchard, J.A. Jay, F. Aron, S.T. Henderson and L.E. Lara, Nature Geoscience, 30 June 2013, DOI: 10.10.1038/NGEO1855.